During cherry season, try this yummy dessert that I’ve adapted from Silvena Rowe’s Feasts — though Rowe mentions getting it from Carmel Pince, “possibly the best Jewish restaurant in Budapest.” In other words, it’s far enough removed now that if you were to show this post to Carmel’s chef, he’d probably vehemently deny having created anything remotely like it. While cherries (especially sour ones) are very popular in Hungary, the pistachios illustrate the culinary influence of the Ottoman Empire that ruled the region in the 16th and 17th centuries. 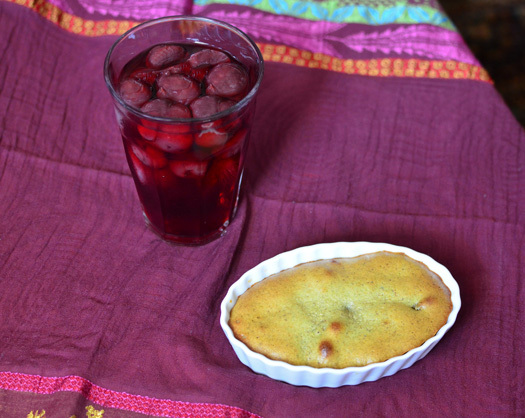 I complement this simple but delicious gratin with a cherry kompot, a beverage widely prepared in Eastern Europe as a way of preserving fruit for the winter. The dessert makes about 6 servings, but this depends on the size of your ramekins. I’ve played with various sizes and form factors, and the top picture shows 3″ diameter ramekins (containing slightly over 3 fl oz), while the bottom one feature a 3″x5″ oval (with a capacity of about 5 fl oz). Cut the brioche into thin slices. Place on the rack in a 300 F oven, and toast for 20 minutes, flipping the slices after 10 minutes. Let cool. Process the brioche in a blender (or a food processor) on high speed until finely ground, stopping frequently to scrape the bottom. Reserve. Place the cherries on a baking sheet lined with parchment paper, and dry in a 300 F oven for 45 minutes. Let cool and reserve. Place the pistachios, brioche crumbs, sugar, vanilla extract, heavy cream, and egg yolks in a blender, and blend until very smooth. This takes several minutes, stopping regularly to scrape the sides and bottom. Transfer to a bowl, and mix in the cherries. Beat the egg whites to soft peaks, and fold into the batter. Grease six 3″ diameter ramekins with the butter. Laddle some batter into each of them, shaking them to remove air pockets and leaving about 1/4″ headspace. There may be a bit of leftover batter, but try to use all the cherries. 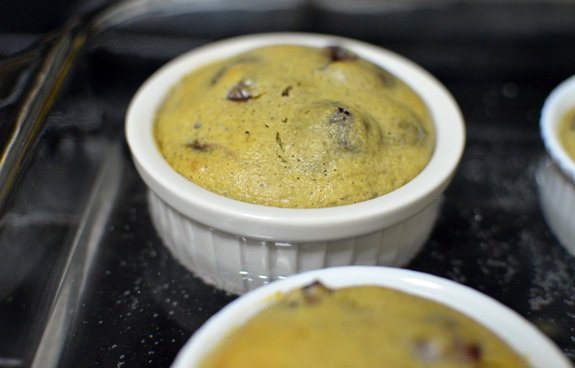 Place the ramekins in a baking dish filled halfway with water. Bake in a 400 F oven for 25-30 minutes. A toothpick inserted in the centers should come out clean, and the tops should be barely colored. Let cool for 5 minutes, and serve. Place the cherries, water, and sugar in a saucepan, cover, and bring to a boil over medium heat. Boil for 5 minutes, and let cool. If you want to keep the kompot in jars, transfer to sterilized pint jars, seal and process in a 200 F water bath for 15 minutes. This looks good. I have that Silvena Rowe cookbook and there are so many recipes in it I want to try. So far I’ve only made the honey and vodka-marinated beef carpaccio, which was very tasty.